Surprise is no longer a factor. Not only do audiences know by now that Marvel Studios are capable of polished, exhilarating superhero films that appreciate their interconnected universe, but it's also clear that Anthony and Joe Russo are no longer just "the comedy directors" of episodes from Arrested Development and Community. 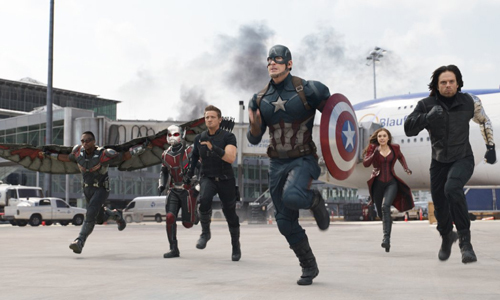 Their intro into Marvel's universe, Captain America: Winter Soldier, took a sharply-written script driven by political intrigue in the vein of Three Days of the Condor and shaped it into a finely-paced thriller, one that smartly tempered comic-book bluster with authentic dramatic maneuverings. It's because of this genre balancing act that expectations have been naturally elevated for Captain America: Civil War, another politically-driven storyline driven by personal values and government meddling that pits superheroes against one another. The Russo Brothers once again deliver bold action and deep conflicts, even though Civil War lacks some of the substance and tautness of their previous entry, interrupted by numerous energized introductions to new characters in the universe. While Civil War draws a lot of direct plot threads and inspiration from the Mark Millar-written comic storyline of the same name, a bunch of factors -- the established universe and rights issues with central characters -- keep it from being a direct adaptation. The general frameworks is there, though: after a violent explosion during an Avengers-led mission incurs collateral damage, the US government puts the wheels in motion for increased oversight and accountability of superheroes through the form of a registration act. Anchored by guilt over previous missions, Tony "Iron Man" Stark (Robert Downey Jr.) stands in approval of this registration; Captain America (Chris Evans), the bastion of freedom and unbridled heroism, opposes it. Matters are further complicated following another terrorist attack amid the discussions, one that implicates the involvement of Bucky Barnes (Sebastian Stan), the Winter Soldier. Amid the clash between the heroes over their principles, Cap and his partner, Falcon (Anthony Mackie), seek out his old friend before the authorities can get to him first, putting them in violation of this new registration act. Obviously, different superheroes in the Marvel universe are going to respond differently to being regulated, and seeing where the land on that spectrum becomes an engaging aspect of the opening act of Civil War, one that's front-loaded with dialogue and deliberate exposition as it shapes the conflict. There aren't really a lot of shocks in terms of who falls on what side of the debate, but that's a testament to the general consistency of the characters in how they've appeared and evolved in the previous films, as well as the strength of their allegiances throughout. It does make for predictable verbal grandstanding, even from Captain America's perspective as he takes the side of the "criminals", but the amicable sparks flying between them -- between Cap and Iron Man, between Vision (Paul Bettany) and Scarlet Witch (Elizabeth Olsen), and Black Widow (Scarlett Johansson) caught in the middle -- still draws one into the dramatic comfort zone of their stances. The Russo Brothers handle these conversations with simmering emotion not unlike they did with Winter Soldier, gradually escalating the political hostility of the scenario up to its breaking point. The marketing for Civil War touts this friction between heroes as the central point of the blockbuster, but the search for Bucky Barnes actually takes on the bulk of the film's forward motion, creating the divergence between the heroes that tests their new allegiances. Unfortunately, Cap's hunt for his old friend comes across as more of an obligatory device instead of the same kind of substantial driving force that propelled the Russo Brothers' Winter Soldier, relying on an opportunely concealed mystery through an enigmatic antagonist, Helmut Zemo (Daniel Bruhl), that suffocates under the weight of the posturing superhero titans. That's not to say that this pursuit for the Winter Soldier isn't compelling: it culminates into a fine close to the dramatic arc involving Captain America and Bucky Barnes, driven by emotional conversations about their embattled past that regularly branch into vigorous action sequences -- arguably too vigorous considering the shaky camerawork -- shortly thereafter. When entwined with this big, brassy conflict between members of the Avengers, the nuance gets lost. Civil War also diverts its attention from a singular narrative to further world-building for the Marvel universe, dropping in a few new, awaited characters who already have a future of standalone movies mapped out for 'em. One, T'Challa, also known as Black Panther, runs effortlessly alongside the parallel plotting: he's a prince and warrior driven by vengeance, and his personal motivations collide with the pursuit for the Winter Soldier in some explosive ways. Chadwick Boseman brings an earthy, sympathetic energy to this new hero, and when coupled with the sharply-designed catsuit, this new face quickly becomes a force to be reckoned with. The other needs little introduction: Civil War takes time out to unveil Marvel's new Spider-Man -- and Tom Holland as Peter Parker -- and it's a lengthier stretch than expected. Under the Marvel banner, this teenage Spider-Man manages to be delightfully dorkier and equally aware of his senses in comparison to previous iterations. Both characters are some of the best things about Civil War, yet the diversions do force one to recall that, wait, yes, this is actually a Captain America movie. 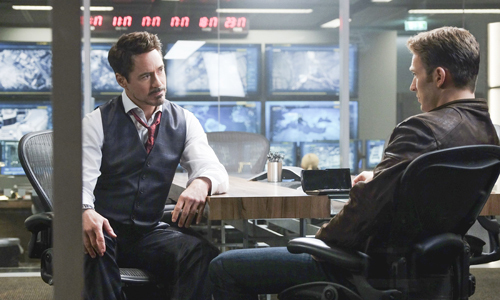 Much of Civil War possesses some kind of underlying motivation and baggage of expectation, as if each character arrival and expression of their position serves another agenda for the film outside of cohesive storytelling. That purpose is, naturally, to create a fairly evenly-matched pair of "teams" within the Avengers who are ready to do battle with one another; a few heavy-hitters in the Marvel universe, godly and green alike, likely weren't included because of how they'd tip the scales. Their ideological disagreements collide in a huge brawl midway through the film, where all these familiar faces unleash the breadth of their powers ... to a degree. There's animosity here, enough to generate pulse-quickening energy within the witchcraft and spider webbing and energy explosions expelled in the lengthy sequence, but this is, after all, a war among heroic allies, and the restraint that comes from that can be seen in their pulled punches. It's quite entertaining, especially in how Spider-Man gets involved, but it also kinda feels like a futile hurdle to cross. There's a lot going on here, much like there was in The Avengers: Age of Ultron, but the Russo Brothers avoid many of the stumbles Joss Whedon encountered with their "Avengers 2.5" spectacle. 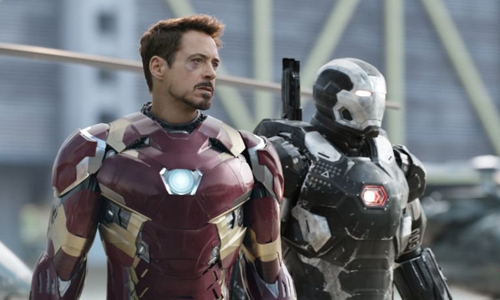 Instead of unleashing another horde of faceless enemies for the heroes both old and new to wipe out after banding together, Captain America: Civil War telegraphs a complex, potent conclusion -- both to the film itself and to elements of the overarching Captain America saga -- that furthers its central intentions of clashing ideology and the mystery surrounding Zemo's scheme, smartly confining the scale of the action after the airport brawl. Granted, in true superhero movie fashion, the conclusion relies on circumstances and stratagems that fit together a little too seamlessly, yet there's a thematic current at the center of it all that justifies the loose logic behind what's happening. Civil War might not be among the best Marvel has to offer, but that this meaningful story unfolds while juggling new characters and the rule-of-cool brawling between superheroes is a welcome surprise in its own right.